Berapa banyak kemampuan monitoring sensor PRTG ? Modular Data Center membuka peluang untuk semua.. Global telecommunications operator Portugal Telecom has opened a modular datacentre in Covilhã, Portugal. The company claims the 75,500m2 infrastructure facility is the “largest, most efficient and most ecological datacentre in the world”. The €90m (£75m) datacentre (pictured) is made up of four buildings and provides 12,000m2 of white space capacity. The telecoms provider inaugurated the first of the four buildings on 23 September 2013. The single block features six rooms with 520m2 of capacity and a power usage effectiveness (PUE) of 1.25. Portugal Telecom chose Covilhã as a strategic location to build its datacentre because of the site’s low seismic activity and its chilly winter temperatures that will enable the facility to use outside air for cooling. The technologies used in the datacentre facility allow it to use free cooling for 99% of the time. There are also a large number of solar panels around the facility that will provide clean energy to help it achieve its PUE target. The new facility’s PUE compares with an industry average PUE of 1.88 and the IT energy efficiency will enable greater sustainability and higher competitiveness, according to the company. PUE, a metric developed by the Green Grid, is used to determine the energy efficiency of a datacentre. It is calculated by dividing the amount of power entering a datacentre by the power used to run the computer infrastructure within it. PUE is, therefore, expressed as a ratio, with overall efficiency improving as the quotient decreases towards 1.0. Internet giants such as Facebook achieve a PUE of 1.07 in their datacentres. Portugal Telecom’s Covilhã datacentre will provide an annual availability of 99.98%and has been granted a Tier III certification by the Uptime Institute. Datacentre tier standards are used to determine availability in a facility. The tiered system, developed by the Uptime Institute, offers companies a way to measure return on investment (ROI) and performance. The standards comprise a four-tiered scale, with Tier IV being the most robust. 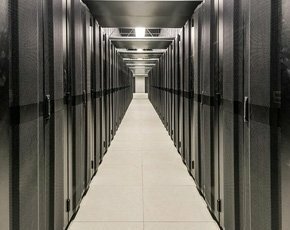 Recently, network provider NTT Communications said it is building a datacentre facility in the UK to meet the growing demand for scalable and reliable colocation services. The new facility, in Hertforshire, will provide tier IV upgrades to its enterprise customers. With the launch of its eighth datacentre, Portugal Telecom’s datacentre network capacity will increase from 14,000m2 to 26,000m2 of white space, from 6,000 to 56,000 servers, and from 3PB (petabytes) of storage to 33PB of storage. The telecoms provider’s cloud offerings include cloud storage and file sync services, software as a service (SaaS), collaboration as a service (CaaS), platform as a service (PaaS), and infrastructure as a service (IaaS). The company said the Covilhã datacentre will allow it to expand its global positioning in the cloud and datacentre services market and help it offer cloud services to newer geographies, describing it as a “landmark investment which fulfills its technological transformation cycle, which began in 2008”. The IT project is expected to create 1,400 direct and indirect jobs. Dalam Lab mereka telah melakukan test hingga 50.000 sensor dalam 1 server dan tidak menjadi masalah, namun semua tergantung jenis sensor apa yang kita monitor. Is there a site planner tool for planning large installations of PRTG Network Monitor? I would like to plan a large installation of PRTG. Can you assist me? 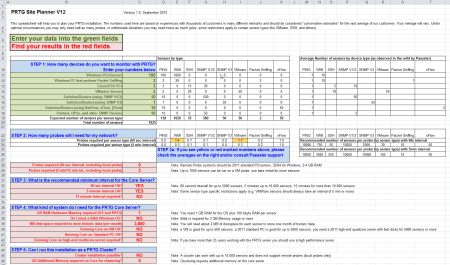 There is an Excel file available that will help you plan out your PRTG installation(s). You enter the kind and number of devices you would like to monitor, and we give you a recommendation on the hardware, the number of recommended remote probes, and so on.